Frederic vs Francois – In It For the Monet! 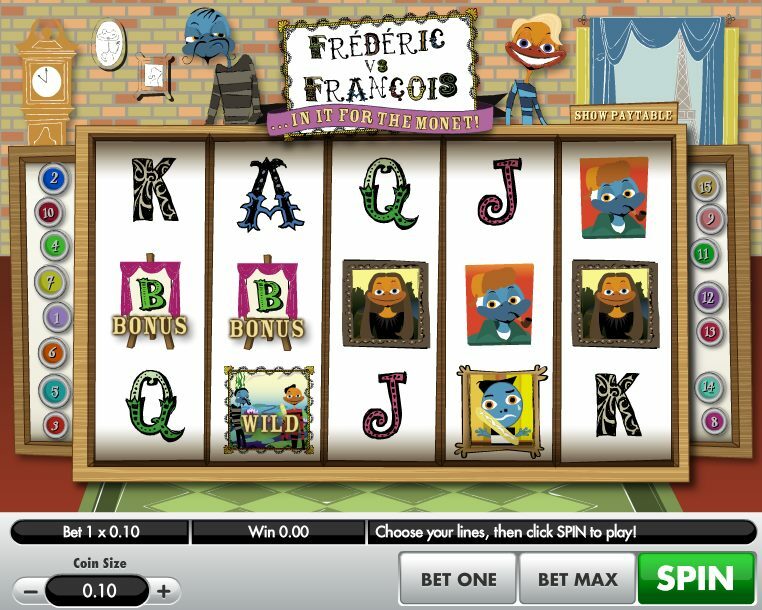 I played this great little slot from Gamesys in its mobile phone version and loved its quirky sense of humour, zee little French touches, and the art theme. Played out over five reels and 15 paylines, the game features two bungling art thieves - the titular Fred and Frank - plus some 60s-style graphics straight out of The Pink Panther. Elsewhere on the reels there is a picture of Edvard Munch's classic artwork, The Scream, plus some stylish 10-to-Ace icons. In fact, if you've played BetSoft's amazing Parisian-set crime caper, After Night Falls, then you'll certainly get a kick out of this. The Wild is the Monet symbol. It substitutes for all symbols other than the Bonus symbols, of which there are a couple. Keep an eye out for the easel icon. It only appears on Reels 1, 2 and 3, but when it appears on those three reels together you’ll trigger the Painting Bonus. Here you’ll have to slip on the beret and slap on the oil paint as you pick easels from a selection of 15. 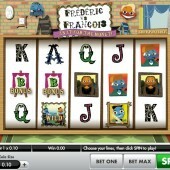 From here you’ll determine your free spins and multiplier. Hit three more Scatters and you’ll bag a further 15 freebies. That's it when it comes to bonus features in this game, but you're not really playing F vs F for its multi-layered bonus rounds. 15 free spins may not seem a lot, but re-trigger it and you can be in line for some great wins. That's if you can trigger the round in the first place, of course; hitting three Scatters L-R can prove to be frustratingly elusive. As we mentioned at the top of the review, if you like the quirky French thrills of this game you'll love Betsoft Gaming's 3D slot, After Night Falls. And while we're on the Betsoft tip, check out another of the leading developer's titles - A Night in Paris - which is a great 5-reel, 30-payline slot with slick intro sequences, perfectly rendered symbols and lovely 3D animation.